Former Penguin Bryan Trottier is many things. Hall of Famer, six-time Stanley Cup winner (twice with the Penguins), YouTube super star. He channels these things in a letter to his younger self over at The Player's Tribune. He includes several snippets on his time with the Penguins. 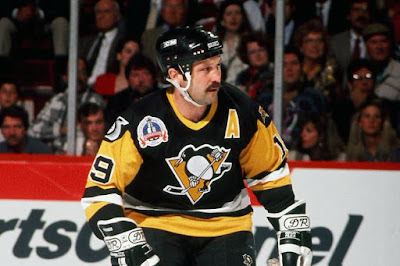 In 1990, you’ll sign with the Pittsburgh Penguins. You’ll be brought there for one reason — to get Mario Lemieux and a young, talented Penguins team to the next level. To make them understand what it takes. She will look at you like you’re an alien, but eventually you’ll talk your way to Mario’s room, where he’ll be recovering from surgery with his wife by his side. And he’ll look at you like, Yeah, of course I want to get healthy, you lunatic. I just had surgery. Like I said, I know this seems a bit extreme. But you need to let him know you care. You need to let him know how much it means to you. Your coach in Pittsburgh will be “Badger” Bob Johnson. Appreciate this man, because your time with him will be cut prematurely short. He’ll be the most positive human being you’ll ever meet. He will make you realize, perhaps for the first time, that you’re playing a kid’s game for a living. That every day at the rink is a good day, no matter what. And Kevin will roar like a lion. Hockey will be fun. When you go out on the road, Kevin will overtip every single waitress and doorman and cab driver. When they look at him in disbelief at the wad of bills, he’ll say the same line every time. You’ll cry with laughter around this guy. You can learn a lot from the way Kevin disarms everyone and treats them the exact same way — from the general manager to the equipment guys. When Mario returns after missing 50 games, you’re going to witness pure greatness. Pure grace on ice. He’ll be one of the most generous and straightforward people you’ll ever meet in the game. He will be your Jean Beliveau. He’s quiet for a superstar, but when he speaks up, you’ll be able to hear a pin drop. Before a critical playoff game that year, you’ll feel the nerves in the room. Something will need to be said. And the room will go absolutely nuts. You will feel like a kid again. In that moment, you will know it: They have what it takes. And you’ll win back-to-back Cups with the Penguins. EDITORS NOTE: Sure seems like something missing from the current Penguins locker room. One small thing, though. There’s this thing in the future called YouTube. I know this is hard to wrap your head around, since you currently only have one TV channel, but hear me out. Watch what you say on the ice, kid. You’re going to be so hyped up to beat the Minnesota North Stars in the ‘91 Finals that you’re going to try to get in a guy’s head. His name is Brian Bellows. You have nothing against the guy. It’s just gamesmanship. But you’re … well, you’re going to use some salty language. You’re going to call him a superstar, among other things. I know you’re thinking, Okay? No big deal. You can’t hear what the guys are saying on the bench. Well, in ’91, they’re going to have a hot mic on you and your buddy Kevin Stevens. Someone is going to save that tape in an archive somewhere. Then by the mid-2000s, something called YouTube will exist, which will allow pretty much all of recorded human history to be watched by anyone, at any time. And you’ll shoot the teacher a nervous glance, praying this kid doesn’t finish your now-semi-famous rant. So remember, kid: there’s always a mic somewhere. Be careful. This is only about half of the article. The entire read is exceptional and worth your time. Click here to read more from Hall of Famer Bryan Trottier.